Dolly Rocker Girl: and she says, "your debutante just knows what you need, but i know what you want"
and she says, "your debutante just knows what you need, but i know what you want"
A lot of people believe that just as Warhol had ‘used’ Sedgwick, that Dylan had done the same, that he never had any intention of making a film with her, and that he was just leading her on for the sake of it. Though it is evident that Edie perhaps believed she would be offered a contract with Dylan’s manager Albert Grossman, it has never been proven that Dylan offered her a role in a feature film. What he had apparently offered her was a part in what would become the documentary “Don’t Look Back,” where director DA Pennebaker had filmed footage of Sedgwick for. At the end of 1966 Edie left her residence at the Chelsea Hotel (she had burned down her Sutton Place apartment that October) to go home to Santa Barbara for the holidays. Her brother Jonathan described her as “really weird when she arrived at the ranch. She was an alien. She’d pick up what you were about to say before you’d say it. It made everyone uncomfortable. 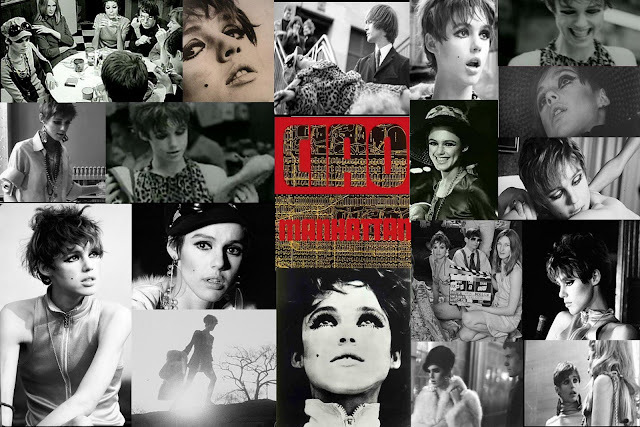 She wanted to sing and so she would sing, but it was a drag because it wasn’t in tune.” To the family, Edie had become “a painted doll, wobbly, languishing around on chairs, trying to look like a vamp.” Edie, in the “Ciao! Manhattan” tapes, admitted to being caught by her mother trying to buy Eskatrol (a form of speed) and was tricked by her parents (after giving her Nembutal, they claimed she held a dangerously high fever and needed to go to the hospital) into being checked into the psych ward at the county hospital. After Edie was released from the hospital, she went back to the Chelsea and continued her drug habit. She had spent over $80,000 in drugs over six months and to fill her need, she would steal art and antiques from her grandmother and sell them. By early 1967, Sedgwick was so dependent upon drugs that Neuwirth, unable to cope with Sedgwick’s heavy drug use and violent mood swings, broke off the relationship.